Rhuddlan is an historian's delight. 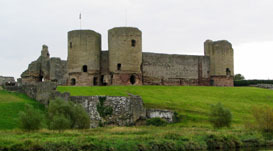 The town, more generally known as a village, is dominated by Rhuddlan Castle. Built by Edward I, it is one of many of its type, built along the North Wales coast. Whilst Rhuddlan boasts many listed buildings, including the Parliament House and Banquet House. The Parish Church of St. Mary's celebrated its 700th anniversary in 2001. Rhuddlan has an excellent 18-hole golf course and green fees are very reasonable. For those with children, Rhyl is only 3 miles away with its Sun Centre, sand and sea fishing. Bodelwyddan Castle standing in the village of Bodelwyddan, only 3 miles away, houses part of the National Gallery and has beautiful gardens, play areas, gift shops etc.. A visit is most worthwhile. For the more adventurous, why not consider a 30 minute drive to the spectacular Snowdonia National Park. The views of snow-capped Snowdon, standing over 3,500 feet are stunning. You can walk to the summit or if you're so inclined, you could try climbing it! The easier option, however, is to take the famous small train of the Snowdon Mountain Railway. The historic City of Chester, with its Roman ruins and excellent shopping arcades, is only 25 minutes away and is very easily accessed from Rhuddlan. 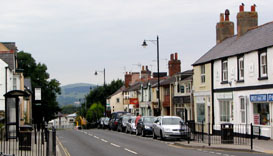 The town of Rhuddlan is renowned for its Edwardian Castle. As you will see from the accompanying pictures it is an impressive structure, especially when you consider that it was built between 1277 and 1282. But even more impressive is the diversion of the nearby River Clwyd that, to suit the demands of the English King Edward, was rerouted and straightened from its estuary at Rhyl to where it passes Rhuddlan Castle three miles upstream. This mammoth task, undertaken with an army of ditchers 1800 strong, was necessary for the castle to remain faithful to Edward's master plan of always having sea borne access to his castles during his 13th century campaign to subdue the Welsh. The town of Rhuddlan was laid out at the same time and 21st century visitors can walk streets that echo this original 13th century plan. Should you enter the town from the west and are lucky enough to park your car in one of the few places on the west bank of the River Clwyd, (there is also parking at the castle) you will be rewarded with fine views of the castle, its position in relation to the river, and also views of the ancient church of St Mary's. From the west bank it is just a short walk across the bridge and up the hill into the town. You have the choice of visiting St Mary's Church on your left or bearing right to visit Rhuddlan Castle. In the high street there is a carved stone plaque on the gable wall of the Parliament Building that commemorates the 'Statute of Wales', some times known as the 'Statute of Rhuddlan'. The plaque reads 'This Fragment is the remains of the building where Edward I held his Parliament A.D. 1283. in which was passed the Statute of Rhuddlan securing to the Principality of Wales its judicial rights and independence'. This refers to the statute issued by Edward 1 in 1284 that regulated Welsh affairs and is said by some to be the 'first colonial constitution' and by others as a charter protecting the rights and privileges of the Welsh. Tradition also states that it was here in Rhuddlan that King Edward, on hearing of the birth of his son at Caernarfon declared the child 'Prince of Wales' thus setting a tradition with the British monarchy that continues to this day.